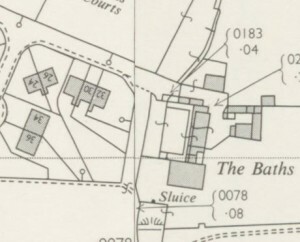 The Baths (or the Bathings as it was sometimes called) was the name given to the farmhouse located at the end of Bath Road in Thornbury. The name of the place is derived from the fact that it had a public swimming pool in its grounds. Unfortunately we have been unable to identify the person who had the initiative to dam up the little stream in the field running down from Vilner towards Gillingstool in order to create a bathing pool and public wash-house. The Baths are mentioned in Robsons trade directory of 1839 and they were there in 1840 when the Tithe Survey was carried out. 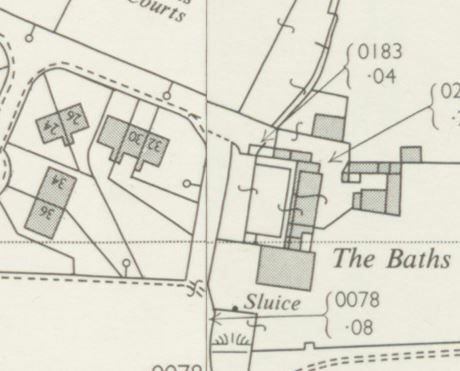 The map accompanying the survey clearly shows the rectangular pool alongside the side the far house. It is interesting to note that the map shows another large area of water to the east of the house which was of irregular shape. The buildings shown on this map are similar to those shown on later maps published in 1880 and the 1950s (see below). Although Parliament passed the Baths and Washhouses Act in 1846 to encourage local authorities to build public baths and wash-houses, Thornbury was, in this case, ahead of its time. The Baths in Thornbury were probably constructed, as a private initiative, in response to the national cholera outbreak of 1832 when records show that at least two people died of the disease in Thornbury. At a time when there was no bathroom, or even running water, in the majority of houses, it is likely that The Baths were built to help keep clean as recommended by doctors and social reformers who had begun to realise that cleanliness might prevent the spread of infections. 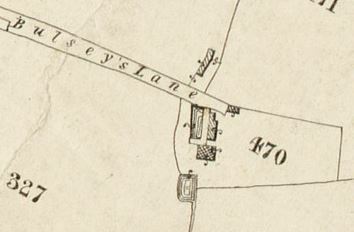 The two images below show extracts of maps showing The Baths in 1880 and the 1950s. We have written in detail about the swimming pool on a separate page relating to Swimming in Thornbury. Click here to read that page. On this page we provide a brief history of the owners of the property. A later abstract of title for the property refers to a Manor Court Roll dated 1st December 1854 at which the property was conveyed from William Rolph to Francis William Yates. Francis William Yates – became the owner of several properties in Thornbury although he appears not to have lived in the town. The Yates family appears to have lived at The Wood, Codsall Wood, Albrighton near Wolverhampton throughout the time he owned the properties in Thornbury. His interests in Thornbury stem from his family’s connections with Joseph Yates who went into partnership with William Rolph (see above) and others to run a bank at 11 High Street. When Joseph died in 1819 he made his nephew, Francis (that is the father of Francis William) one of his executors. He also appointed another nephew, Joseph Yates the Younger (the brother of Francis) to succeed him in the banking partnership. Francis William Yates was baptised on 30th September 1829 in Blymhill, Staffordshire and he was the son of farmer Francis Yates and his wife Hannah (nee Icke) who both came from Staffordshire. The 1862, 1867 and 1876 rate books show Francis owned The Villa in Thornbury and by 1876 he also owned four houses in Upper Bath Road. The 1901 Census shows that Francis William Yates then aged 71 and a land owner lived at The Wood in Donnington, Shropshire. He was living with his wife Annie aged 50 and his son also called Francis William Yates aged 21 who was also a farmer. Francis William Yates junior appears to have been born in Shifnal in 1880. A second son William Yates was articled to a solicitor. In 1911 he sold the site for the new market in Rock Street to Thornbury Rural District Council. Francis William Yates junior married Mildred Alice Hatton in 1909 in Stourbridge. On the birth certificate of their son Francis John Yates on 1st December 1911 Francis was said to be living at Albrighton in Shifnal. Captain Francis William Yates of the Kings Own Yorkshire Light Infantry died of his wounds on 25th April 1915 at Number 7 Stationary Hospital Boulogne. His probate record shows that his home address was Hollis House Albrighton Shropshire. His executors were Ernest Edward Bird and Walter William Yates. Francis William Yates senior died on 30th September 1916 aged 80. His probate record shows that his address was The Wood, Codsall Wood, Wolverhampton and that William Walter Yates solicitor and James Henry Wyley were appointed as trustees of his estate which amounted to £88516 7s 4d. Francis’s executors carried on owning The Baths until 1949. Then they sold the farmhouse to Herbert Henry Pearce for £1250 whose family had been tenants of the property since 1918 or earlier. 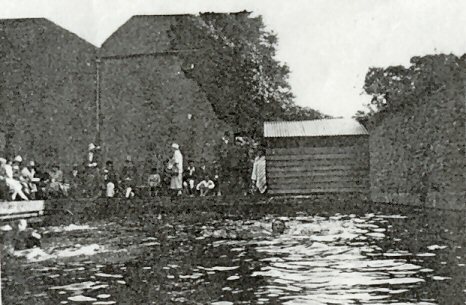 The swimming pool was sold to Thornbury Parish Council for £350. On 3rd February 1971 Herbert Henry Pearce sold the farmhouse and land to Thornbury Rural District Council for £14,500. The council were developing this area of the town and building the housing estate known as Streamleaze. They demolished all the buildings and used the land to build a children’s home called Bathurst House and sheltered housing units called ‘ The Bathings ’, ‘Spring House’ and ‘Brook House’. The children’s home has since closed.